Backpacker Magazine describes hiking California's Lost Coast as "...the purest expression of solitude..." However, on Memorial Day weekend, 300 or more backpackers sallied forth onto the Lost Coast Trail making the Lost Coast "...the purest expression of hundreds of backpackers..." according to me. However, the wilderness is a large place and there was enough room and space to accommodate all comers. The Lost Coast Trail is an epic hike and has it all: narrow and rocky beaches, soft sand, cliff climbs (and descents), grassy alluvial flats, sea lions, marine otters, crystal clear creeks, rattlesnakes, waterfalls, whales, wildflowers, and regrettably, one helicopter rescue. We enjoyed all of these things except for the medical emergency, but more on that later. 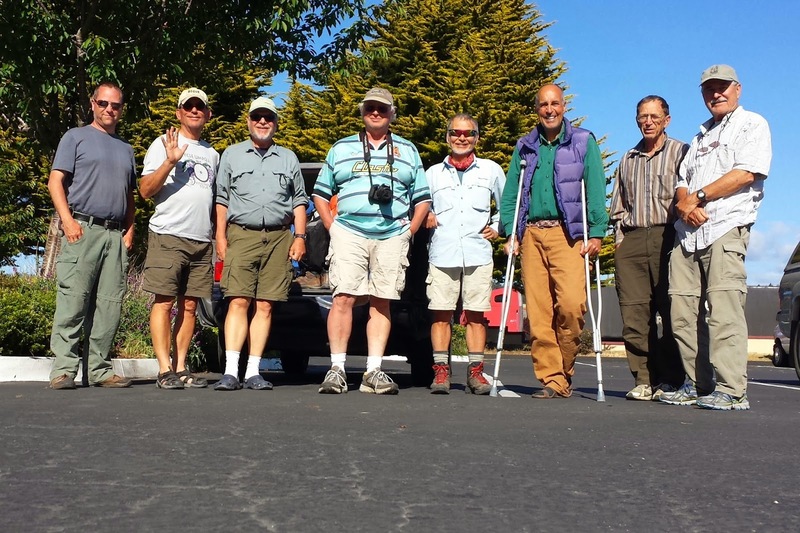 Eight of us (six from Roseburg and two from the Monterey Bay) made the long drive on an incredibly narrow and windy road down to the Mattole River Campground where we snagged 3 campsites. In hindsight, we were quite fortunate because the trailhead parking lot filled up, the campsites were quickly occupied, and cars were parked down the dirt road for several hundred yards. Most campers camped in the road right next to their cars. A BLM ranger told us 110 hikers had set out in the morning with a similar number waiting to go the following morning. Such is life on the Lost Coast on Memorial Day weekend. Uncharacteristically, we had a late mid-morning start but there was a reason for that. The tide crested at 10 o'clock and we started then so as to have a receding tide for the rest of the day. Several portions of the Lost Coast Trail are impassable or dangerous at high tide so a tide chart is essential for safe hiking. Rising sea levels due to climate change may eventually take away the Lost Coast Trail and years from now we can bore the great-grandchildren with the 1,179th retelling of "I hiked the Lost Coast Trail when..."
The first portion was on soft sand until we rounded the grassy headlands of Punta Gorda after which the trail climbed up onto a small bluff above the rocky shore. The winds at the point were something else, one strong gust centerpunched me in the chest and my knees buckled like a boxer about to take a concussion-induced nap on the canvas. On the cliffs, the winds would literally blow us off the clifftop trail as we hiked, fortunately the wind pushed us inland and not seaward and off the cliff. At three miles, we arrived at the historic Punta Gorda Lighthouse. Short and squat as far as lighthouses go, what makes this lighthouse notable is the sheer remoteness of the site. Dozens of hikers and backpackers (the crowds had not thinned out yet) climbed the narrow iron stairs for the view from the cupola. Below, there was a rusting metal tank and a whole bunch of sea lions basking in the sun and a whole bunch of backpackers taking a whole bunch of pictures of the sleeping creatures. It sort of reminded me of the O'Neill family after Thanksgiving dinner. For the next few miles, the trail undulated up and down on the grassy hillsides. The King Range drops 4,000 feet in about 3 miles so "hillside" is probably not the correct descriptor. At any rate, the steep slopes plunged faster than a Victoria's Secret neckline and they were grass-covered and wind-blown. At Sea Lion Gulch, the trail dropped into a ravine and spit us out onto the beach. This was our first taste of rock-hopping but not our last. The rocks made us wish for soft sand and the soft sand made us wish for rock hopping. There was just no pleasing us. Things got interesting at a detour around a landslide, with the detour taking us up into the grassy slopes again. The drop down to the beach was precarious and required the use of hands. There was a group behind us and after observing our hands-on crawl down the cliff face, they deigned to attempt the descent. I'm not sure which group was smarter. Our reward for the tricky descent? Walking on rocks again! However, the walk was short and sweet as we arrived at nearby Cooskie Creek, our camping spot for the night. We followed a rough footpath upstream where we took over a campsite (thanks Dan, for the tip!) big enough to accommodate all of us. A lengthy foot soak in the creek's cool and clear water was enjoyed by all but the fish. As we left Cooskie Creek, a couple of young ladies in blessedly skimpy bikinis were slathering lotion on each other right next to the trail in what was a perfect commercial for hiking the Lost Coast Trail. Did I mention the Lost Coast scenery was awesome? Things then got tough in a hurry as we hiked on a narrow strip of shore comprised of medium sized rocks and boulders. All thoughts of bikinis were immediately driven from my head, supplanted by focused attention on all the rock-hopping and wave-dodging. At places, the "trail" narrowed down to just about a yard until it petered out altogether at a small point. The guys had stopped so I leapfrogged them and got as close to the point as I could. And just like that, the wave receded and I saw a quick path to the other side that was there just for an instant, so I quickly ran through. One by one, the others showed up and not all made it past with dry feet. At Randall Creek, the route thankfully took us off the beach and onto level, grassy, and windy Spanish Flat. The flat is a broad alluvial bench situated below the mountains and just above the shore. A well-maintained jeep road was the trail and best of all, it was flat! Happy to get a reprieve, our legs carried us to the end of the flat in no time at all. All good flats do come to an end, however, and we were returned to the rocks on the beach. After a short walk, we reached Big Creek and began looking for campsites. John had a rock move on him while wading across Big Creek and his knee bent the wrong way and quicker than you can say "medial collateral ligament", his hike was over. After the initial triage, it was apparent that John could not walk any further and he would require an extrication. Dale and Ray both had SPOT units and Dale hit the SOS button on his and we waited. None of us had ever had to use the SPOT, so as backup I flagged a group of passing backpackers and they agreed to call 911 upon arrival at the trailhead the following day. After two and a half hours, a Coast Guard helicopter flew by the mouth of the creek and we waved blankets and jackets and the bird landed on the narrow beach. I'm not religious but I can honestly say I saw an angel and he was wearing an orange jumpsuit, two layers of neoprene wetsuit, and a flight helmet. John hopped, with assistance, on one foot until he could hop no further. At that point, a stretcher was brought over from the helicopter and we carried John over the rocky terrain and loaded him into the copter. Seeing the helicopter fly away with John safely inside as the sun set along the scenic coast was one of the most beautiful sights I have ever seen. Day 3 would be the hardest day as we pushed forward on the rocks and sand. We'd eventually wind up hiking 10 miles as we wanted to camp as close to the trailhead as possible, the reason being the shuttle service we had hired was to pick us up at 10 o'clock the following morning. The hiking wasn't too bad at first as the trail for most part undulated up and down on the grassy slopes before we hit Big Flat. The flat had a primitive airstrip on it and the runway did double duty as the trail. Day 3 was the least windiest day on the trip and we were soon baking under the warm sun. On the plus side, Big Flat was big and flat and we made pretty good time on the three mile long bench. From our perch above the ocean, we observed a steady stream of whales heading north. At the end of the beach, a tricky descent down a cliff that required the shedding of packs and the use of hands dropped us onto a rocky beach. The rest of the day would be spent walking on soft sand, shifting mounds of gravel, and hopping from rock to rock. Several points required the judicious timing of waves to get around. The scenery was reliably spectacular with a long curving shoreline culminating in a point that would be our trail exit. Numerous creeks waterfalled down to the shore with lush verdant growth alongside the creeks resembling oases of sorts. There were no palm trees or camels however, although I did bring my hump. We set up camp at Horse Mountain Creek and it was windier than a political convention. Lane's tent got yanked out of his hands and sailed like an escaped kite, landing up the hill from our camp. Ray was sitting next to me and had to ask "Who's tent is that blowing across the beach?" I answered "Dude, that is YOUR tent!" and he quickly took off running, collaring the recalcitrant tent rolling across the beach with all his gear inside. After watching all the misbehaving tents, I opted to just lay in my sleeping bag staring at the stars overhead. Despite the wind, I was pretty comfy. This was getaway day and we got an early start so as to arrive at Black Sands Beach by 10 o'clock, our prearranged time to meet with the shuttle service. At the trailhead we waited and waited and waited and waited...obviously something had gone amiss. We tried calling the shuttle service by phone but we had a weak signal and the phone calls lasted just long enough to be disconnected. Finally, we sent text messages and did get a reply back. They had us scheduled for pickup the following day and once the error was realized, they (Jill and Sherri of Lost Coast Shuttle) quickly made amends by picking us up as fast as they could get to the trailhead. We piled into Jill's van and she took us to the Shelter Cove Deli where we partook of the best fish and chips I have ever eaten. For the last three days, I'd been eating oatmeal bars that tasted like particle board, the fish tasted much better! Several of our gang wanted to get a commemorative group picture but I said "Nope", as we were short one hiker. John had been cooling his heels in an Arcata motel after being diagnosed with a sprained knee, any group picture would be incomplete without him. Several hours later, we descended en masse into a motel lobby and got a nice picture of eight hikers and two crutches. Anything they have written about me probably is not true! Congrats on completing the hike! Poor John.